Brussels sprouts are a polarizing vegetable - some people love them, some people hate them. I love them, but tend to get stuck in a rut of roasting them and serving them as a side dish. So when I bought a bag of brussels sprouts last week, I excitedly turned to Plenty, figuring that Ottolenghi would have some genius recipe idea that would reinvent this veggie for me. But sadly, there was nothing in the index, and I resigned myself to the idea that maybe this cookbook isn't perfect after all.Then a few days later, I was looking up another vegetable, and spotted this recipe, apparently indexed incorrectly. So yeah, there's a flaw in my beloved cookbook, but luckily it has to do with the indexing and not with the recipes. And indeed, Ottolenghi has given me a new perspective on brussels sprouts - stir frying! Why hadn't I thought of that before? This recipe combines brussels sprouts, mushrooms, and tofu with a sweet and spicy sauce. You still get the delicious browned bits that come with roasting, but this stir fry turns brussels sprouts into a quick and flavorful main course. 14 oz. extra-firm tofu, presssed dry with paper towels and cut into cubes about 1-inch square and 1/2-inch thick. In a small bowl, whisk together the chile sauce, soy sauce, 1 tbs sesame oil, rice vinegar, and maple syrup. Set aside. Cut the stems off the brussels sprouts and cut them each into three slices, top to bottom. In a large nonstick pan, heat 1 tbs of the oil over high heat. Add sliced sprouts and a pinch of salt and cook until sprouts are browned and crisp-tender, about 6 minutes. Only toss every 2 minutes or so to give sprouts a chance to brown well. Transfer sprouts to a large bowl and keep pan over heat. Add 1 tbs of oil to the pan. Add tofu and spread pieces out into an even layer on the pan. Cook until tofu is well browned, tossing only every 2 minutes or so, about 10 minutes total. 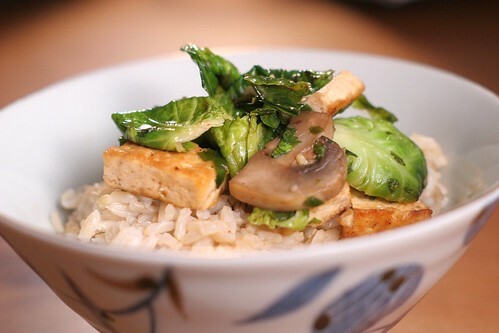 Transfer tofu to the bowl containing the brussels sprouts and keep pan over heat. Add 1 tbs of oil to the pan. Add mushrooms and saute until they shrink and begin to lose liquid, about 2 minutes. Add green onions and chopped chile and saute for 2 more minutes. Reduce heat to medium and return the tofu and sprouts to the pan. Add sauce and cilantro and toss to combine. Taste and add salt if necessary. Heat until all ingredients are warm. and serve immediately with rice. I am a brussels sprout FIEND. Love em. Yet somehow I missed this in Plenty! It's definitely going on the need-to-make-ASAP list. I am ALL over Brussel sprouts these day but, like you, usually roast them. they're wonderful that way but this is great way to change things up! I do love brussels sprouts.. but I don't love tofu... maybe someday. The rest of the dish looks fabulous to me though! Megan, I'm sure it would be just as good with your favorite protein instead of tofu! love me some brussels sprouts. am always looking for new ways to use them.